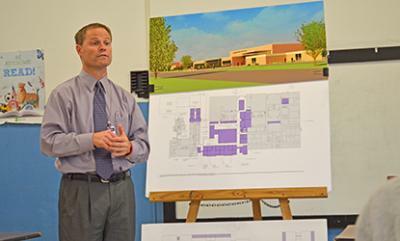 Glencoe-Silver Lake Superintendent Chris Sonju explained some aspects of the school district’s proposed $24 million building bond at a forum Thursday night at Helen Baker Elementary School. Voters will go to the polls May 12 to vote on the bond issue. Glencoe-Silver Lake (GSL) School administrators continued to outline why they think the Helen Baker School ought to be replaced by an addition at the high school/junior high campus at a public forum Thursday night. The forum was the second of three the district has planned before the May 12 vote on a proposed $24 million addition to the high school and junior high that would allow the district to close Helen Baker. The next forum will be Thursday, May 7, at 6 p.m., in the high school media center. The district also is offering coffee and cookies Thursday, April 30, at 9 a.m., at Helen Baker to give residents a chance to see that building and ask questions. Superintendent Chris Sonju said Thursday night that if the district continued to use Helen Baker for its kindergarten through second-grade students, it would need to spend about $8 million to bring the building up to standards, and probably another $4 million to add on necessary space to address the overcrowding. GSL Business Manager Michelle Sander agreed, noting that three sides of the Helen Baker property is surrounded by residential homes, while the fourth side is fronted by 16th Street E.
Adding onto Helen Baker, she said, would take away a significant portion — if not all — of the school’s playground area. Fortunately, Sander added, there is ample room at the high school campus to allow an addition with still plenty of room for playgrounds and fields. For more from the forum, see the April 29 print edition of The Chronicle.